As one of the last untouched stretches of wilderness, the Arctic is an exciting and, at times, challenging setting for a polar expedition. But with the chance to see incredible wildlife and mountain vistas also comes biting winds, snow and chilly conditions. So, what’s an intrepid explorer to do? Unless you’ve lived in similarly frosty climes, like Alaska or Ontario, a visit to the frigid Arctic will present a challenge for your wardrobe and might even require you to buy some new gear. To make sure you’re not left out in the cold, read on for our comprehensive guide to packing for your Arctic polar adventure. The key to beating the cold, especially when moving between the warmth of the ship’s interior to the colder weather outside, is to wear layers. Pack a variety of jumpers and sweaters you can layer beneath your heavier jackets while moving around on deck. 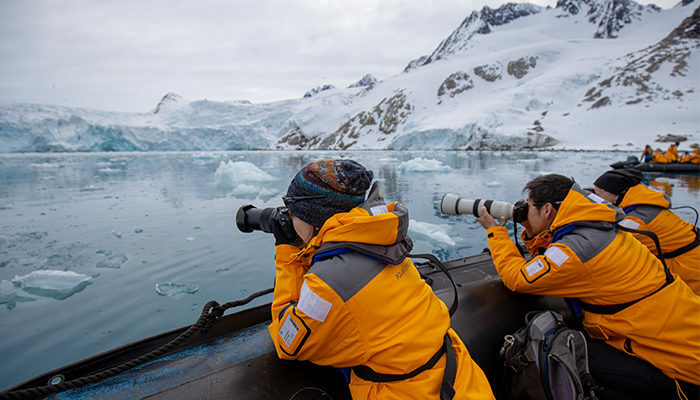 You could be standing on deck for extended periods of time watching wildlife, so wearing layers can prevent a chill from setting in. The last thing you want is to be running downstairs to your cabin to fetch another top just when a polar bear decides to approach the ship! Similarly, layering your gloves by wearing a thinner pair beneath a heavier waterproof pair will not only keep your hands warmer, but will also provide protection from wind chill if you need to remove the waterproof gloves to use your fingers (for example, to adjust your camera settings). 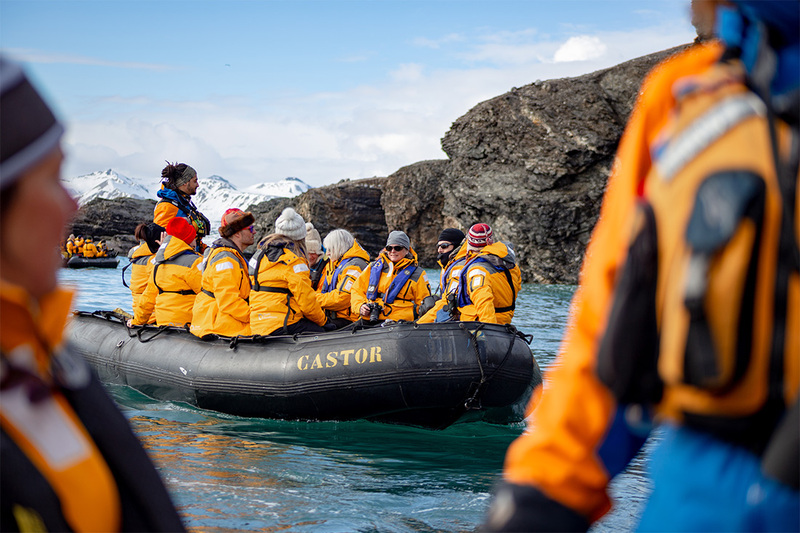 Zodiac and land excursions are an exciting part of every Arctic expedition, but being out in the elements means you’ll need to be ready for a turn in the weather too. It’s generally a good idea to wear a layer of thermals (t-shirt and pants), followed by a sweater and outdoor jacket. You’ll also be required to wear a life vest at all times, even when on land. Your backpack is then worn over your life vest. There’s no need to pack your own boots if you’re travelling with Peregrine Adventures. You’ll be given a pair of rubber boots to wear on expeditions at the start of your trip. It’s recommended that you wear thick socks to go with your boots. It’s also worth noting you won’t be allowed to participate in an expedition if you don’t have waterproof pants and jacket, so check and double check you have these packed before leaving home. Make sure to pack the right equipment to capture the best photos. No doubt the unique wildlife and scenery of the Arctic is a major drawcard to this region, for both professional photographers and amateurs alike. But shooting in Arctic conditions is different to any other destination, with the cold climate sapping the charge in your batteries and random wildlife encounters meaning you’ll need to quickly adapt your shooting style to suit the circumstances. Below is a handy list of what to pack if you plan on making the most of your photography. One wide-angle lens for landscape photography. One telephoto or standard zoom lens for photographing wildlife. At least two SD cards that can be changed over each day. A laptop and back-up drive to store your photos at the end of each day. Comfortable jumpers, sweaters and fleeces. Thick, insulated jacket for the outdoors. Waterproof jacket or poncho for wet conditions. Casual pants, such as chinos or jeans. Thick wool or cotton socks suitable for the outdoors and expeditions. Thinner, more casual socks for inside the ship. Wind and waterproof pants, ideally with pockets. Two pairs of gloves: one waterproof and one cotton. A beanie that covers your ears, preferably with interior fleece lining for extra comfort. Scarf or other face protection. Tracksuit pants for lounging in. Sturdy walking boots with a good tread. Comfortable slip-on shoes for walking around the ship interior. Swimsuit, in case you’d like to take the Polar Plunge. Sunscreen, to prevent sunburn caused by light reflecting from snow and glaciers. Sunglasses with UV protection (essential when you’ll be looking at a lot of white landscapes that reflect sunlight). Eye mask, especially for sensitive sleepers adjusting to the midnight sun. Electrical adapter plug. It’s usually a good idea to pack more than one in case you need to charge multiple devices at once. Battery chargers for your phone, camera and laptop. Watch: phone batteries tend to run short in colder weather, so a watch is a more reliable source for telling the time in Arctic environments. Torch or flashlight (with spare batteries): a thoughtful way to navigate your room in the evening without waking your cabin mates. Lightweight and waterproof day pack. Small first aid kit containing essentials, such as band aids and painkillers. Second pair of prescription glasses, if required. Itinerary and travel documents, such as your passport, visa, insurance details and airline tickets. A hat: With winds potentially reaching up to hurricane levels, wearing a hat on deck could see it blown away into the Arctic oceans. A towel: Save room in your bag! You’ll receive a towel in your cabin on arrival, which can be laundered as many times as needed. If you plan to take the Polar Plunge, you’ll also be given a second towel immediately after returning to the boat to dry yourself. If you’ve got your next Arctic adventure booked and ready to go, then pull out a pen and start ticking off the list. Don’t have a trip booked? Check out our range of Arctic polar expeditions. Feature image by Justin Meneguzzi.